What’s all that stuff in your Start Menu? All those icons all over your desktop? Here’s a simple answer- Shortcut Explorer. It looks a lot like Windows Explorer, but shows you only the shortcuts, along with the information in the shortcuts controlling which program will start and how it will run. 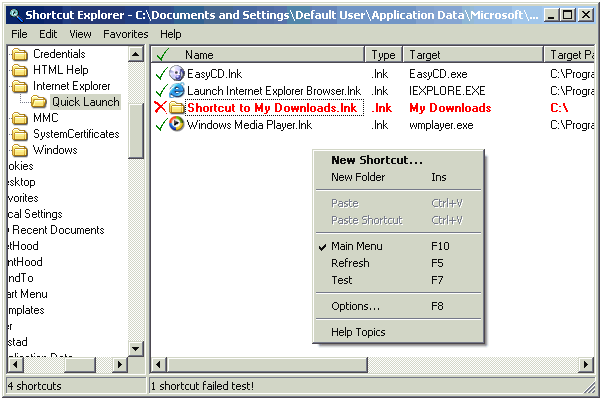 As with Windows Explorer, you can move, copy, rename, delete, or create new shortcuts and folders. Now includes shortcut testing, favorites menu, automatically locates system folders such as Start Menu, Quick Launch, etc. Make your Start Menu and Quick Launch bar convenient for you, not some installer! Several sytem components from Brad Stowers at Delphi Free Stuff. Distribution package by Inno Setup.